Watch out, Beckham — he’s 1/2 Salvadoran and (if his daddy has his way!) 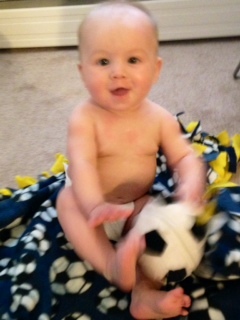 destined for futbol greatness! Benny. Benny D. BenDiego. Benny Boo Boo. Boo Bear. You, my sweets, are a whopping SIX MONTHS OLD today! How is that even possible? It seems like we just met … but time is totally flying. Your fifth month has been your biggest so far. You have mastered your jumperoo and love, love, love spending time in that contraption. You love to stand and jump and when we say “Go Ben, jump jump jump” You get this wild glimmer in your eyes and begin practically heel clicking and squealing in delight! You began tucking your legs under you into what will eventually become a crawling position. You began eating solid foods — and sitting in your high chair! So between six bottles a day and your new tastes of food … you’re an eating champ. You GREW. A lot. You’re rapidly outgrowing all your 3-6 and 6-month clothes so it’s a good thing Mommy stocked you up on 9 month for spring! At nearly 17 pounds, you are the same size as your sister at 9 or 10 months. You’re still only in the 30-40th percentiles, but you feel huge to us because she was just so tiny by comparison. You, however, are long and lean(ish) whereas she was short and full of delicious rolls. You found your feet — and are constantly pulling off your socks and grabbing your toes — from a sitting or laying down position, you are super-curious those little piggies!! You hold your own bottle (have been for a while but really do it now!) and if you’re anything like your sister, you’ll be taking the spoon out of our hands soon, too! Your eyes are now green — will they stay as such?! — and your hair has really come in, soft and blonde. Your mouth is made for everything you see these days … no teeth yet, but you’re teething like crazy. No matter the object, your chubby little mittens hands will shove it in your mouth. And my hair is lately your favorite thing to grab. You had your first ear infection 😦 And pink eye. A double whammy. Oh and did I mention eczema? You’ve got that, too, buddy … poor baby! In spite of using Pee Pee Tee Pees or a wash cloth, you’ve still managed to perfect the art of the “pee arc” in the tub … thank you for that … one of the many differences between boys and girls … oh what fun lies ahead … ! YOU ARE CONSTANTLY SQUAWKING AND TALKING! (Read as: babble). We cannot get enough — and we’re told by total strangers that you just seem to be the happiest baby — always smiling. We like to agree. You squeal and smile at them and it’s hard not to fall in love with you. You respond to sounds we make with your own versions of them, and react the louder we get. Maya has to cover her ears now and often says, “He’s too loud!” but I think she loves it. She finally has a playmate in you, and there’s nothing I love to see more than my children “playing” together (which, at this stage, is Maya dangling a toy in front of you and then you taking it from her and shoving it in your mouth or watching a video together. You love to receive the attention of everyone but especially your big sister, cooing at her and screeching to her as though somehow she should understand your secret language. (Someday, you two will share a secret sibling language!). When she walks in the room you get louder and more boisterous — it’s precious to watch. You will go to anyone still — no stranger danger yet, probably thanks to being in many people’s arms at daycare? — but you have begun to experience separation anxiety from us at night-time. Oftentimes you cry when we put you in your bed — and lately it’s been tougher to get you to sleep at night and even some days for naps. Once asleep, you sleep til about 6 AM, but sometimes bed-time can take 30-45 minutes. You are still super-snuggly (unlike your sis who chooses if/when she feels like being snuggly!) and I treasure our 6 AM nursing sessions — it’s often the best part of my day, just you and me in a dark room. And when you fall asleep on my shoulder after? Bonus for all. We regularly Skype and FaceTime with my family and when you see them you get really excited, as though you recognize their voices/faces. I’m guessing you probably can’t truly at this stage, but I like to think so. Especially living so far away (us in Michigan, them in NY, NJ, and California) these early bonds are key — and this is how we bonded between them and Maya and it has worked beautifully. You are a joy, Benjamin, and we can’t wait to see the little boy you become. You were pretty much born with your eyes wide open and I hope you always stay that way. So far, so good. PS–My Instagram is filled with my fave pics of you! love! i would have said it three times, but mama did. 😉 i can’t believe he’s six months already? !